Buy making a one off donation to Yorkshire Wildlife Park Foundation, you’re helping to conserve and protect the worlds most at-risk species. Add 25% more to your donation at no cost to you. A Gift Aid declaration allows Yorkshire Wildlife Park Foundation to claim tax back on eligible donations. It means that for every £1 you donate to Yorkshire Wildlife Park Foundation we can claim back 25p, at no extra cost to you. By ticking the "Yes" box, I agree I would like Yorkshire Wildlife Park Foundation to reclaim the tax on all qualifying donations I have made, as well as any future donations, until I notify them otherwise. I understand that if I pay less Income Tax and/or Capital Gains Tax than the amount of Gift Aid claimed on all my donations in that tax year I may be asked to pay any difference. I understand that Yorkshire Wildlife Park Foundation will reclaim 25p of tax on every £1 that I give. Gift Aid does not cost you a penny more, but can add an additional 25p to every £1 you donate. When Yorkshire Wildlife Park Foundation receives a donation from a UK taxpayer, we're entitled to claim an amount of tax (calculated at the basic rate of income tax in that year) paid on that donation. Once you have given your permission for us to do this on your behalf, there is no need for you to do anything else. Buy making a monthly donation to Yorkshire Wildlife Park Foundation, you’re helping to conserve and protect the worlds most at-risk species. All monthly donations are acknowledged with a personalised certificate you can print plus an animal factsheet of your choice. Please note, your donation confirmation receipt with links to your personalised certificate and animal factsheet may appear in your junk mailbox. You have chosen to donate £2.00 monthly. Don’t want to donate online? 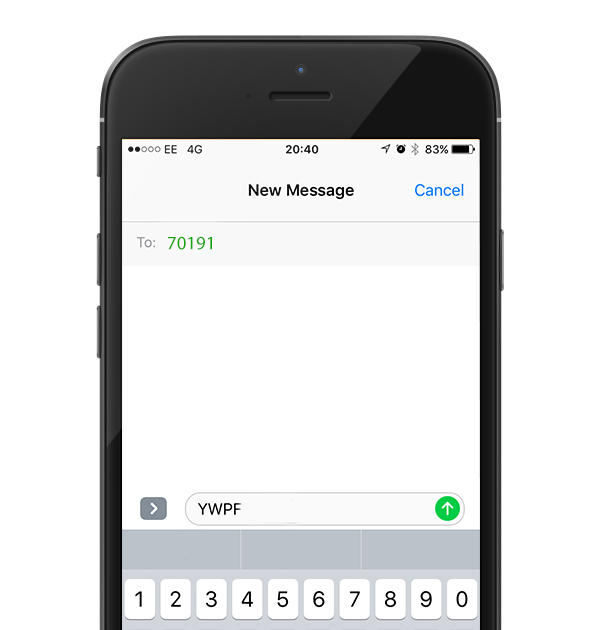 You can just as easy donate by text! You can donate from £1 up to £10 by following the instructions below. It’s so quick and easy!